12 Volt LED light bulbs feature new technology which combines enhanced light output with reduced energy consumption. G4 Back Pin bulbs have extended 1" pins exiting perpendicular the back of the LED bulb (pins may be trimmed to fit). 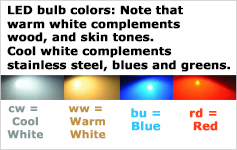 90 degree directed illumination (instead, for narrow fixtures or for 360° illumination (such as for use in readers or wall sconces) consider using our G4 bi pin tower style LED bulbs). I am very happy with this product. The quality met my expectations. I would recommend unequivocally. Everything, service and product, are 5 star! Ordered two warm versions to check fit and company response. Both were great, so ordered 45 more of the cool white versions. Received quickly and all worked flawlessly. Hope they last a long time. This LED bulb will fit numerous 12 volt Light Fixtures with "rear mounted" sockets, so you can easily upgrade them to LED. FriLight 8150, FriLight 8235, FriLight 8308, FriLight 8311, FriLight 8590, FriLight 8611, FriLight 8658, FriLight 8707, FriLight 87072, FriLight 8940.